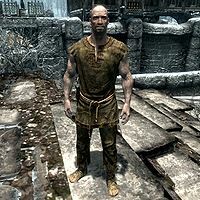 Angrenor Once-Honored is a Nord beggar who was a former member of the Stormcloaks. Upon raising his disposition by giving him a coin, he will become a potential candidate for marriage. Rolff: "You come here where you're not wanted, you eat our food, you pollute our city with your stink and you refuse to help the Stormcloaks." Suvaris: "But we haven't taken a side because it's not our fight." Angrenor: "Hey, maybe the reason these gray-skins don't help in the war is because they're Imperial spies!" Suvaris: "Imperial spies? You can't be serious!" Rolff: "Maybe we'll pay you a visit tonight, little spy. We got ways of finding out what you really are." He can be found relaxing in Candlehearth Hall from 4am to 10am. He then goes to the Stone Quarter, leaning against a wall. At 4pm he patrols Windhelm for twelve hours, then returns to Candlehearth Hall. He wears a set of prison clothes: a roughspun tunic with footwraps. He carries an iron mace and a selection of lower-class items. However, unlike Rolff, he does not make mention of his hatred when spoken to normally, but begs for coin instead. He will sometimes say, "I was one of the best soldiers in the Stormcloak army, until I took a sword through the chest." He will brag about his ex-Stormcloak prowess, saying, "I once killed six men, single-handed, while rescuing my brothers-in-arms from ambush by an Imperial patrol." and "I'd be out there fighting the Imperials right now if it wasn't for my war-wound." He will also make mention of his current condition, saying, "Ever since that Imperial craven ran me through from behind, I've had trouble breathing. Don't have any trouble drinking though." and "I'm not too proud to admit that I need a bit of help from time to time." He was meant to have another set of dialogue if he moved into the Aretino Residence, which will never be heard due to a bug. He would have defended his claim on the house to you, saying, "What? Were you hoping to claim this house for yourself? Well, the Aretinos always liked me, so I think I'm family enough to take up here." Angrenor also would have referenced Innocence Lost, saying, "Rumor holds that the Aretino boy brought an assassin here. Sounds like nonsense to me." He would also have disparaged his fellow Windhelm residents, saying, "The milk drinkers in this town wouldn't last five minutes in a real battle." Once married, Angrenor will still beg for money, even if he is living at your home. This bug is fixed by version 2.0.2 of the Unofficial Skyrim Patch. He is the only beggar who is able to be married in the game. After completing the quest Innocence Lost he carries around a key to the Aretino Residence. He should have moved into the house after the quest, but the scripting is incomplete. Angrenor does not have the proper voice files if you open the shop dialogue after choosing him as your spouse in the quest The Bonds of Matrimony. He instead uses the "MaleEvenTonedAccented voicetype" (ie Farengar Secret-Fire's voice). ? If their conversation with Suvaris is interrupted by combat (e.g. by a dragon or vampire attack), Rolff and Angrenor will be stuck standing at the main gate permanently. 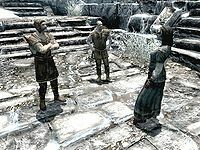 This bug is fixed by version 2.1.3 of the Unofficial Skyrim Patch. This can be fixed by using the command startscene CD91F. This page was last modified on 9 November 2017, at 04:19.